Go Mt. 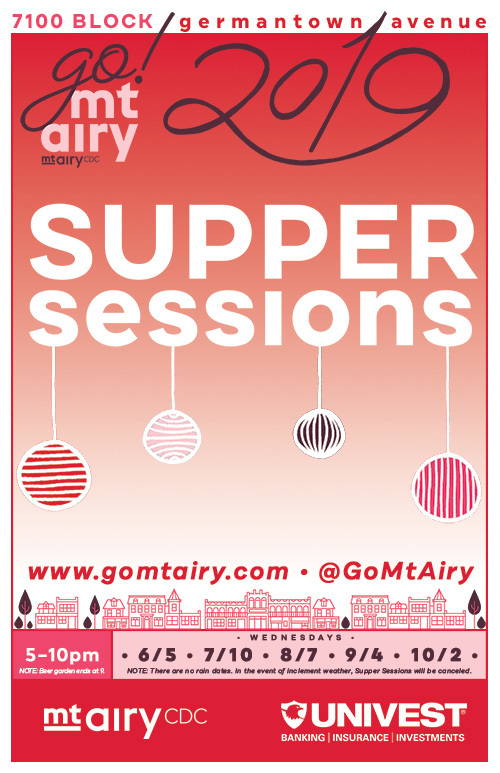 Airy Supper Sessions, Mt. Airy CDC’s signature event, is back for Year Four on the Avenue, with generous support from Univest. And new for 2019, we’re going monthly. *Due to the Fourth, we’ll host July’s Supper Session on the second Wednesday. PLEASE NOTE: there are no rain dates; if it rains, that day’s session will be canceled. At Supper Sessions, we close the 7100 block of Germantown Avenue to cars, trucks and buses, and return the Avenue to The People. The ten restaurants and bars on the 7100 and 7200 blocks bring tables, chairs, and service out onto the belgian blocks and trolley tracks of Northwest Philadelphia’s historic commercial corridor. Four food trucks each week add some rotating variety, a DJ sets the vibe for the evening, and kids activities including story time ensure that Supper Sessions is fun for the whole family. While the 55 parking spaces in the municipal lot behind Rothe Florists is closed for the event, over 80 spaces in the lot behind the Sedgwick Theater are available—enter off of Chew Avenue. SEPTA’s 23 bus is also rerouted one block east to Chew Avenue. If you are interested in vending, please CLICK HERE for vendor information and application. Stay tuned for the full lineup and additional information!